Becoming a mother and raising your child is undoubtedly the most fulfilling experience in a woman’s life. Being an intense hands on job, it does leave a toll on the body. Most of the changes only affect the way you look without compromising your health. For generations, women have had to bear the brunt of pregnancy and child birth without any option to reverse the physical effects of it. Cosmetic treatments may now offer the chance to improve your appearance in a safe manner. Weight gain is the most visible change after pregnancy. The areas usually affected are the tummy, hips and thighs. Most women are body conscious now and try their best to lose weight, but some of the fat deposits can be resistant to the efforts to get rid of them. Fat deposits can also occur in the arms and the back, the enlargement of the abdomen weakens the muscles and this causes a prominent paunch, which in many cases can only be addressed through liposuction and body contouring procedures. For most women, exercise and dietary changes will not be able to address all of these problems satisfactorily. Through stretching and recoiling of the skin this creates excess loose skin which can look unsightly. 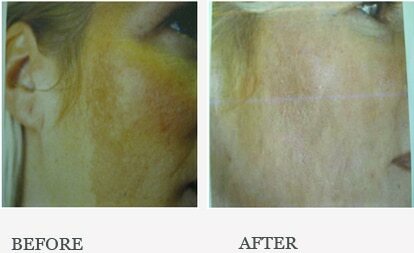 Laser skin tightening may help, by causing collagen contraction. Stretchmarks Stretch marks are probably the most frustrating after effect of the bulging tummy. The stretch marks occur due to breaks in the elastic fibers in the deeper layers of skin due to the rapid inflation of the tummy. The marks often become prominent after the tummy is deflated. Stretch marks can be red or silver. 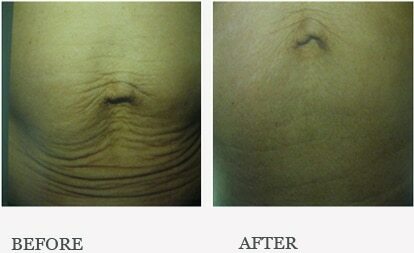 Various treatments are available that may help to reduce the appearance of stretch marks and make them less obvious. The clinic has a range of treatments from milder to aggressive CO2 resurfacing to improve the appearance of stretchmarks. The appearance of fine blood vessels or thread veins are common after pregnancy and can look unsightly especially on the legs and face area and can affect confidence. Laser thread vein treatment may improve the appearance of unsightly veins. Dr. Sagoo is one of the leading experts in laser leg vein therapy. Due to hormonal affects during pregnancy there can be increased pigment formation in the face, which can lead to a condition called melasma. The Solihull Medical Cosmetic Clinic under the supervision of Dr. Sagoo offers combination packages to address these problems to restore confidence and general well being. Ask about “Mummy Tummy combination packages” which may help to address all of your concerns about the effects of pregnancy on your appearance, and give you more confidence.